Greece has seen a significant increase in tourism since the depths of its economic crisis in 2012 and this more optimistic climate has encouraged many more domestic flights linking different islands and also the mainland with the islands. Some interesting and unusual combinations are now available which used to be connected only by long ferry journeys. Thessaloniki, Greece’s capital of the north, is attracting a great deal of interest as it is a vibrant city of historical and gastronomic interest. City breaks in Thessaloniki are becoming increasingly popular and with a twice weekly air link to Samos, one of our favourite islands, a two centre holiday makes excellent sense. Neither Thessaloniki or Samos are as yet mainstream destinations so this is an excellent time to visit. On arrival in Thessaloniki you will be transferred (25 mins) to the 3 star Olympia Hotel. The Olympia Hotel has an enviable location overlooking the Roman Agora. This is a quiet location but is only a 5 minute walk away from Aristotelis Square and all the cafes, restaurants and bustle of the city. Have a wander to find your bearings and then dinner in one of the many restaurants and tavernas. If you do not know where to start then give Kostas our local agent a ring for his recommendations. Overnight at the Olympia Hotel, Thessaloniki. After breakfast start with a visit to the Museum of The White Tower which is located on the waterfront. Start at the bottom and work your way to the top floor for a history of this fascinating city. Have lunch at one of the many street and square restaurants and then perhaps a visit to the War Museum which gives a fascinating insight into the troubled history of this strategically situated city at the gateway to the Balkans. Perhaps dine in the evening at the rooftop terrace of. the Electra Palace Hotel on Aristotelous Square for one of the best views of Thessaloniki. Overnight at the Olympia Hotel. There are 30 museums in Thessaloniki. The Byzantine is very well known but a no less fascinating museum is the Jewish Museum. The Jews started arriving into the city in the 15th Century having been expelled from Spain and were instrumental in making Thessaloniki a city of culture and wealth. By the time of the second World War there were in the region of 50,000 living in Thessaloniki - sadly this population was decimated following the German occupation of the city. Then head for the narrow alleys of Ladadika for lunch in one of the many authentic street restaurants. and bars. In the afternoon simply wander round the city, to see the many Roman ruins and hidden Byzantine churches that nestle within the city and indulge in some shopping in Thessaloniki’s wide variety of shops and boutiques. Your taxi will take you back to the airport (25 mins) for your flight (1 hr 30 mins) to Samos and then on by taxi from the airport to the Kerveli Village Hotel in Kerveli (30 mins). We have worked with the Kerveli Hotel (3 star plus) for many years. It is a beautifully located hotel in lush surroundings overlooking Kerveli Bay. You are here to relax for the next 5 days. The hotel has a good restaurant and there are also tavernas within a short walk. The hotel offers a good selection of activities: scuba diving, boat trips, snorkeling trips, cooking lessons, yoga classes and you can also hire mountain bikes. Samos is not a large island and very beautiful with some rather spectacular drives. Why not hire a car for the day, make an early start and drive around the coast and inland through the mountains? There is much to see. 5 overnights at the Kerveli Village Hotel. Your taxi will collect you from the hotel and take you to Samos Airport from where you will fly back to Gatwick via Lemnos. The Olympia is a new hotel, built on the site of the original Thessaloniki Olympia City Baths dating back to 1932. The Olympia is a new hotel, built on the site of the original Thessaloniki Olympia City Baths dating back to 1932. This is a hotel in contemporary and more minimalist style, with clean lines, with a decor consisting of a mixture of granite, earthy colours and oak parquet floors complemented with designer furniture. 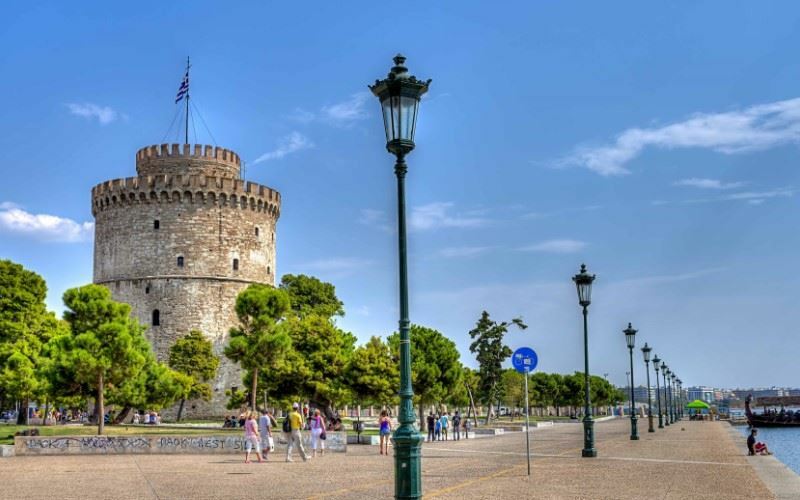 It is located about 500 metres from the city centre of Aristotelous square and within a 10 to 20 minute walk of the port and the promenade, the archaeological Museum, The Museum of Byzantine Culture and the White Tower. Cafes and restaurants are all around. 97 rooms of contemporary style being double and single business rooms, executive rooms that can take an extra one or two beds and junior suites which have a bathroom with a hydro-massage bath and individual terrace with views of the ancient Roman market. All rooms and suites are with telephone, satellite TV, free WiFi, mini safe, hairdryer, and refrigerator.